This playful pair of comical chipmunks are ready for a nutty adventure with you. 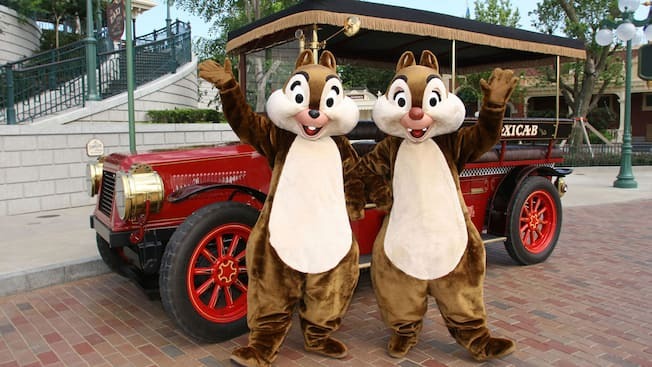 Scurry in a hurry on your way to a meeting with Chip 'n Dale. Those clever chipmunks just love making friends, posing for pictures and, of course, scavenging for acorns! Whether solving crimes, exasperating Donald or just gathering nuts, Chip 'n Dale stick together and have loads of laughs. Chip is the brains in the zany duo of chipmunks. When it comes to being a leader and executing a plan, Chip is the one who takes charge and gets the job done. Dale is Chip’s right hand, who always seems to be a step behind. Both love to torment Donald Duck, but Dale can often be distracted by his appetite for peanuts, acorns, apples and food in general. Chip 'n Dale first appeared in the 1943 short film Private Pluto. They hit their stride 2 animated shorts later as the loveable foils to Donald Duck, a role they were born to play. Later, they scampered into the hearts and homes of a new audience with their television series, Chip ‘n Dale Rescue Rangers. Download the official mobile app to locate favourite characters! View wait times for attractions, browse interactive maps, discover schedule for shows, parades and much more.